What do you get when you cross a jet engine with a bicycle? A jet-powered bicycle, of course! Complete with a red bull can fuel tank in the water bottle cage, the jerry-rigged bike looks like an artistic masterpiece, or a disaster waiting to happen. Its designers are working on the Xwing project, which will fly a jet-powered aerobatic carbon fiber skydiving wing. So by comparison, the jet-powered bicycle is arguably a walk in the park. Wanting to test out the jet engine parameters – its startup time, shutdown time, how it behaves at high speeds, and more – the designers decided to test it out on a moving object: a bicycle. Testing on a lab bench just wasn’t enough. So they created the jet-powered bicycle. A group in Sweden has assembled a jet-powered snowmobile. The device uses a pulse jet, providing a whopping 380 pounds of thrust. That’s a far cry from the space shuttle at 1.2 million pounds of thrust or SpaceX’s Falcon Heavy at 5 million, but still pretty good for a snowmobile. In this chaotic video, masked men scurry about the ice to ignite the jet engine. The vehicle reaches a top speed of around 110 miles per hour. That’s faster than most people drive on the Autobahn. Pulse jets are a type of jet engine that, like their name suggests, deliver propulsion in pulses. This makes them simpler than some other jet engines, without the requirements for moving parts and air input. However, this same simplicity makes them less efficient than highly engineered jet engines for other applications. A Swede was arguably the inventor of the pulse jet engine, so this wacky snowmobile continues a story that now goes back over a hundred years. Incidentally, Robert Goddard, the pioneer of space rockets, created a pulse jet engine in 1931 and installed it on a bicycle – long before there was YouTube. Colin Fuerze has built a jet-propelled go-kart. The Jet-Kart, which he fairly dubs “The most MENTAL kart EVER,” reaches an impressive top speed of over 60 miles per hour. You could ride this go-kart on the interstate highways! He drives the Jet-Kart on an airstrip and exhausts the runway at the end, so maybe he could even go faster. The kart appears to be composed of a few slim structural tubes, and several gigantic jet engines. Running on diesel and gas, it has a couple of large fuel tanks strapped on board. In the video, Colin hilariously wears a suit and tie. While driving, the jets appear to glow with visible radiation. After the high-speed run, the vehicle belches plumes of smoke and fire. A cool young guy has invented the “jet longboard 2.0,” a jet-propelled skateboard. It uses electric ducted fans, a kind of jet engine that uses electricity stored in batteries to create high-speed streams of air. The design offers high thrust-to-weight ratios, making it efficient, especially for small craft. He put the batteries in a carbon fiber container. The jet-board uses an Arduino electronic control unit. He even made a 3D printed enclosure for the speed control device – and a kill switch to stop the jet-powered skateboard in case its rider falls off. The inventor previously created a cool hand-held bar with a couple of jet engines, which you could hold onto as it pulled you on any set of wheels – a precursor to the jet-powered skateboard. With only one of the twin jets running, and at half power, the first test ride was already too fast to handle. Who knows what top speed is achievable? It’s about time. 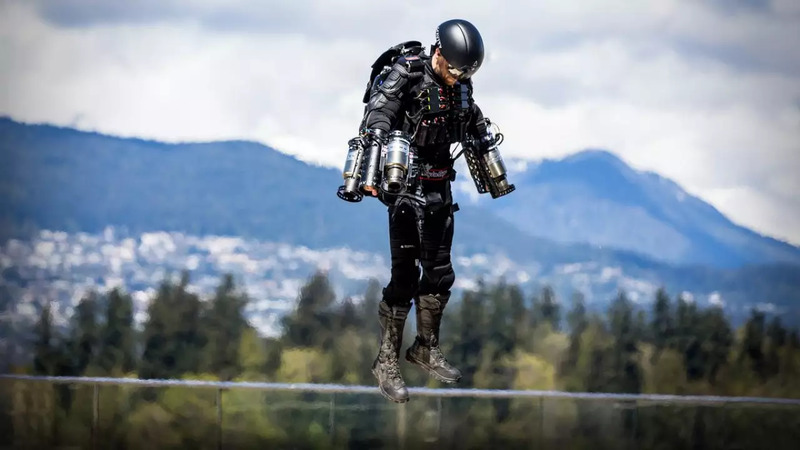 Finally, someone went out and built a workable jetpack. Now, how much longer until these are on store shelves? British inventor Richard Browning flew his own device, reaching a top speed of 32 miles per hour. That’s fast enough to fly over city streets! Browning earned a spot in the Guinness Book of World Records. He set the record for fastest flight of a jetpack, over a distance of at least 100 meters (328 feet). The Brit flew over a lake (Lagoona Park in Reading), in front of a small crowd. He used six kerosene jets, spread out in a sweet formation over his upper body. He envisions a future in which you can fly up and down the beach, then land on an accompanying Hercules plane.